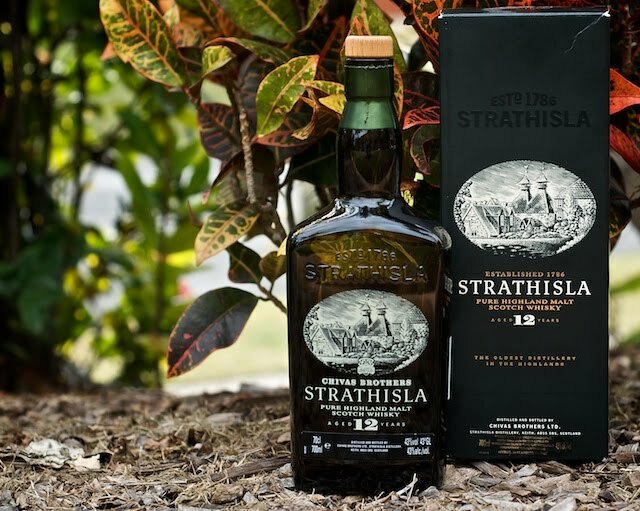 The Strathisla 12yo is a Speyside single malt whisky sourced from the Chivas Brothers owned distillery of the same name. Established in 1786, it is the oldest distillery in Speyside and is the current headquarters of Chivas. Judging by the photos I have seen of the distillery, it is easy to see why, with the lovely double-pagoda building set amongst beautiful scenery. It is the only Chivas malt I have tasted, apart from the popular Chivas Regal 12yo blend. One can tell the Strathisla is a key ingredient in the blend, but more on that later. Let me consider the packaging: Looking at this whisky on the shelf, I can't say I am immediately attracted to it, which is a shame because the contents deserve more. The box is a dark green (almost British Racing Green) and made of a thin cardboard. The bottle is a dark green-brown glass. Unusually the label has been printed on the glass itself, somewhat akin to a Corona beer bottle. This could combat blackmarket copies, but unfortunately it fails to inspire, despite the lovely distillery scene depicted. The bottle shape is oblong and is perhaps trying to hark back to a the bygone era (like most whisky's), however I am not sure it succeeds. The nose: Woody oak tones, hints of butterscotch and a strong vanilla essence starts creeps into the nose. A small amount of that wet animal mustiness, but not as prevalent as the Glenlivet 15yo. Not overly alcoholic (43% abv). The taste: You are initially met with those same woody oak flavours, which fade to a smooth rich vanilla, which I can only describe as crème brûlée. This whisky clearly provides the cream to the Chivas Regal blends. I love its simplicity, strong identifiable flavour and no fuss attitude. After reviewing more complex whiskies, such as the Balvenie 15yo Single Barrel and Johnny Walker Green Label, it is a welcome simplicity. This is what also draws me to the Lagavulin 16yo, simple yet effective (relative to its Islay peers). I would suggest it is a quintessential American white oak, ex-bourbon cask experience, and would be surprised if any other barrel type was used in its maturation. The dram-o-meter points to 5.25 from 7. Would I buy it again? Yes, as a no fuss simple pleasure when the mood lends itself. You could probably drink a whole bottle of this and not be offended, however you would probably be offending others at some point! 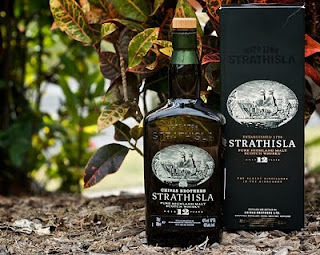 I bought a bottle of Strathisla 12yo recently for a friend. My hope was that it serve as a good introduction to single malt whisky. I know he is partial to the mass-produced blends of Johnny Walker, and I should follow up with him for some comments. Overall, an unexpected surprise. Its not going to win any awards, but that's not the point. As an introduction to the wonderful world of single malt whisky...priceless. But don't take my word for it, I know at least two other members (from the Islay-peat-faction of the club) who own bottles of this, so we'll await their reviews...everyone has an opinion at D.T.W.C.